The turbine broke and the manufacturer went bankrupt, and it never produced the energy that was promised in 2008. SACO — For the last decade, the 100-foot-high wind turbine atop York Hill has greeted motorists as they traveled through Saco on Main Street. What has become a familiar site will be no longer, as the city dismantled it on Thursday and Friday. The wind turbine was purchased from a Colorado company, Entegrity Wind Systems, in February 2008 for $207,000 with a guarantee that the turbine would produce 90,000 kilowatt-hours – $12,800 worth – of electricity annually for 10 years. But it never came close. The turbine was installed in 2008 and produced 16,000 kilowatt-hours during its first 18 months, then broke down. Efforts to fix it faltered and Entegrity Wind Systems went bankrupt in 2009. When the company dissolved, so did the guarantee it had made with the city and Saco was never able to get compensated when the turbine didn’t live up to the promises. In 2016, City Manager Kevin Sutherland shut down the turbine due to safety concerns. The city’s Energy Committee and city staff reviewed the matter, and recommended removing the turbine. 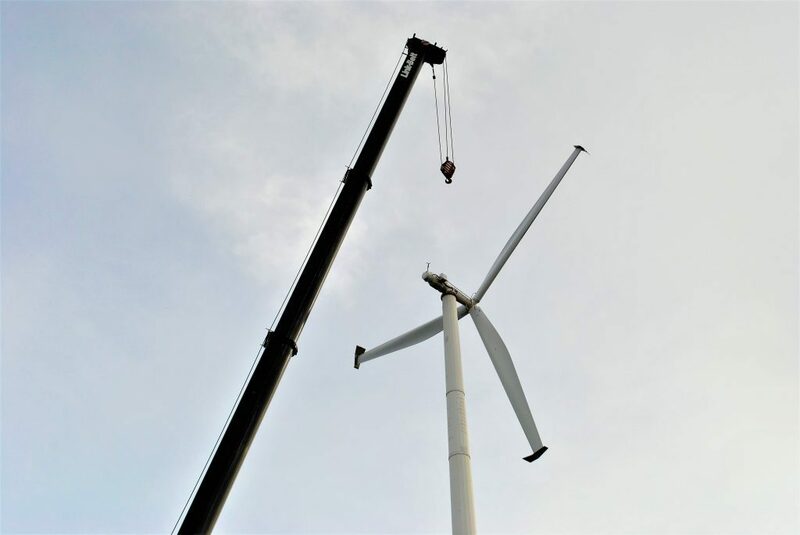 Removal of the wind turbine began on Thursday and was completed Friday. T Buck Construction, the company that installed the turbine, took it down, according to city spokeswoman Emily Roy. “They safely put it up, we know they can safely take it down,” she said. The cost to remove the turbine was $20,000, she said. Roy said city officials are working with the Energy and Sustainable Committee to determine a better use in the future for the piece of land, which is located on Main Street at Saco Island. In the meantime, the site will be the location for the community’s Christmas tree, which is expected to be put up this weekend, said Roy. A Christmas tree lighting ceremony will be held at 4 p.m. Dec. 8 during Saco Main Street’s Holiday Festival. “We are excited to have that piece of property be a community gathering place and a place where people can congregate,” said Roy, noting the location’s close proximity to the city’s train station and the Saco River.